In The Hoop Stocking with Cuff and Sewing Motif - 6 Sizes! 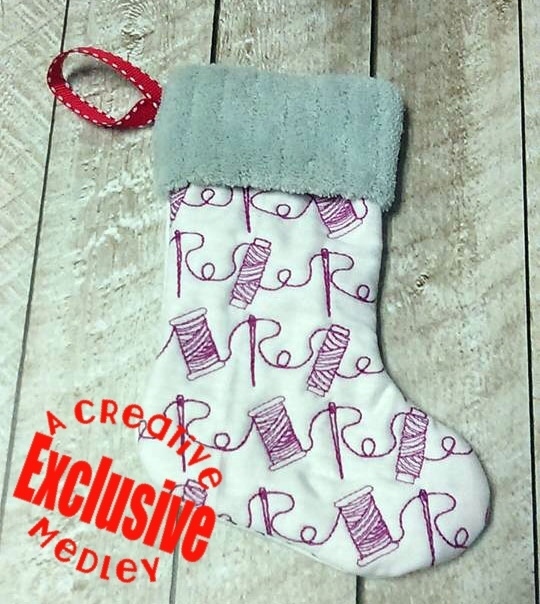 This adorable stocking is made completely in the hoop. The stocking is fully lined with no raw seams and is made in a single hooping. ITH projects look complicated but are quick and easy. Comes with step by step instructions with color pictures. NOTE: A small change has been made from the original Cuff Stocking, so even if you are familiar with how easy it is to make these, take a moment to scan the new instructions. Earn 6 points at checkout OR buy this item for 120 points. This adorable stocking is made completely in the hoop. The stocking is fully lined with no raw seams and is made in a single hooping. ITH projects look complicated but are quick and easy. Comes with step by step instructions with color pictures. NOTE: A small change has been made from the original Cuff Stocking, so even if you are familiar with how easy it is to make these, take a moment to scan the new instructions. Doodle It Santa, In The Hoop - 5 Sizes! In The Hoop Stocking with Cuff and Bones Motif - 6 Sizes! In The Hoop Stocking with Cuff and Music Motif - 6 Sizes! Finish Size 2.68" x 3.86"
Finish Size 5.02" x 7.0"
Finish Size 5.98" x 10"
Finish Size 6.99" x 10.5"
Finish Size 7.8" x 11.67"
Finish Size 7.8" x 14.09"